Zahava is one of the women that makes the Wrapunzel Fangroup so wonderful. Her gentle smile, inspiring stories, beautiful style, and encouraging words are something that many of us look forward to every day. We even named the Empress Circlet after her! A few weeks ago she posted a new style; “Tichel Chignon” she called it. Many of us tried to figure out how she did it and couldn’t get it! So I just had to invite her over to make a tutorial together. We got to spend a little time getting to know each other as well. Beyond her quiet demeanor, Zahava is a proud mother of 11 children, and grandmother of over 20 (and counting, Gd willing!) She just returned from a trip to Israel that her kids surprised her and her husband with for their anniversary. Let’s all bask in her infectious glow, and learn how to tie the “Zahava’s Gold Chignon” together. ← No Shvitzing in This Outfit! Wow! What a tutorial! I really wish I could meet all of you! I love your energy, the tutorials are amazing (if only I could remember them when it comes to time to tie my tichel 😉 lol), and I feel such a connection…you all are amazing and beautiful and I thank you from the bottom of my heart for creating this site! Thank you!! Mama Zahava, you’re so cute! She is soooooo elegant! Keep posting videos with her. 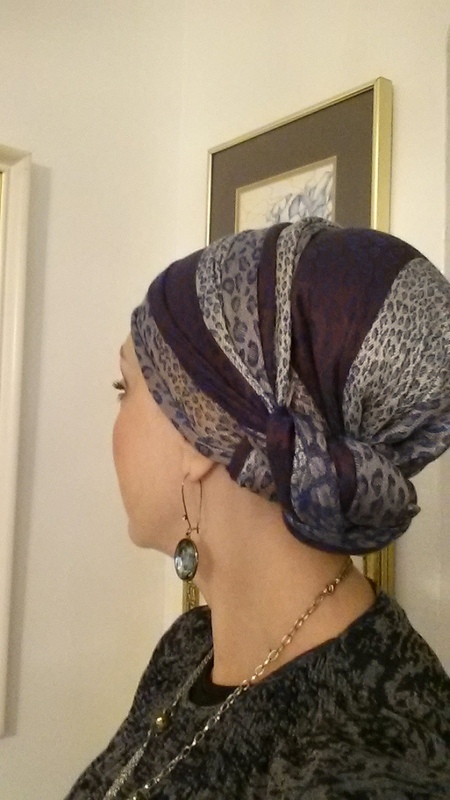 One can see the beauty of this wrap better with a plain scarf. It gets lost with the signature scarf. I love it! It does look like a French chignon. I personally love having tails hanging down at least on one side. And Zahava has such a great personality. You both looked like having fun! And, I loved hearing baby Shalom in the background. Thank you for bringing us this tie. You both look elegant and stunning. I would feel like royalty wearing Zahava’s Chignon for any occasion. Thank you for your work in providing this resource for us ladies who wrap. You all’s time and commitment are invaluable, and much appreciated. I love this tie! I’m always on the lookout for styles that don’t have too much front or side volume, and this one is such an elegant way to have everything up and out of the way. Thank you! Thank you for sharing Zahava and Andrea, I love it!! These videos are so inspiring. Five years ago, the choice to start covering my hair was met with nothing but derision. The alienation somehow gave me an even greater dependence on YHVH. It’s because of your videos I occasionally receive compliments now instead of disapproval. That was a wonderful tutorial and a BEAUTIFUL wrap! And, Zahava, you truly do have the bearing of an Empress. I will definitely try it. Would love to see some more tutorials with Zahava and her new was of wrapping her hair 😊. Yes…exactly what Ennlowe said above. Keep on ladies, keep on! Beautiful, Empress Zahava, and Princess Forest Elf, Andrea! I really love this style of tutorial. What you are saying out loud to Zahava is what I say in my head as I watch tutorials. So it actually made it a lot easier to follow. If that makes sense. I love this wrap by the way, so elegant. Gd willing we’ll do more like this! So glad it was helpful! I’ve been playing with this tie, and discovered you can do it with a sash, too. I can’t seem to make my scarves behave when they go over my head, so i tried it with two 2-in-1s, one folded as a sash. Just pass the twisted piece through the sash. I used both scarves twisted together to make the chignon, and it looks extra intricate, especially since you get extra length to work with! Wore this tie today. I love it! It felt super comfortable and securey entire day. Thank you! I was absolutely delighted to see an elegantly older woman (don’t know exactly how to say that); or maybe I should say someone closer to my age who is wrapping her hair. I only see precious younger ladies which blesses me much, but have wanted to know that there are women my age actually wrapping. I’m so thrilled!